Want to use up some of your stash? Cot quilts for the Special Care Baby Unit at Frimley Park Hospital. The quilts brighten up the unit and help to make it feel less clinical. When discharged, parents take baby and quilt home. Quilts need to be 16" x 20" with 3 layers but NO embellishments such as buttons or beads. The quilts need to be robust enough to withstand regular washing. See Pat Gill at Heather Quilters for more information. The beads help the children to take ownership of their journey and to make sense of the experience they are going through in a very visible and tangible way. The beads gives them a tool to explain it to themselves and others, adults, medical professionals, brothers, sisters, friends and says to everybody “this is my story, this is what I’m doing – its not nice but I’m strong and I will get through it”. Contact Sandy Medhurst at Heather Quilters, she will coordinate the delivery of bags to the appropriate hospitals. Project Linus is a 100% voluntary, non-profit making organisation. It originated in America, arriving in the UK in March 2000. It's mission is to provide security and comfort to sick and traumatised children and young adults through quilts. 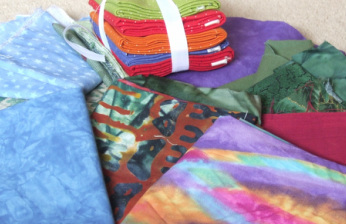 Project Linus welcomes all types of hand-made quilts and blankets whether hand or machine sewn. No embellishments. Quilts must be fully washable and come from a smoke-free environment.